but the principle of how the barrel works is the same for pannier locks albeit that those barrels use flat tangs instead of round pins. 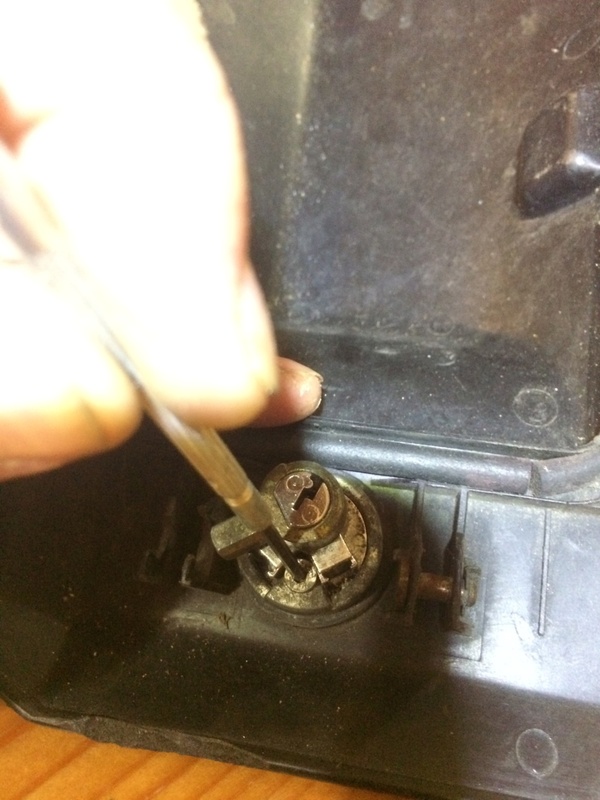 The Key pushes pins in the barrel of the lock up into columns inside the housing. An opposing set of pins is pushed by tiny springs to resist them. 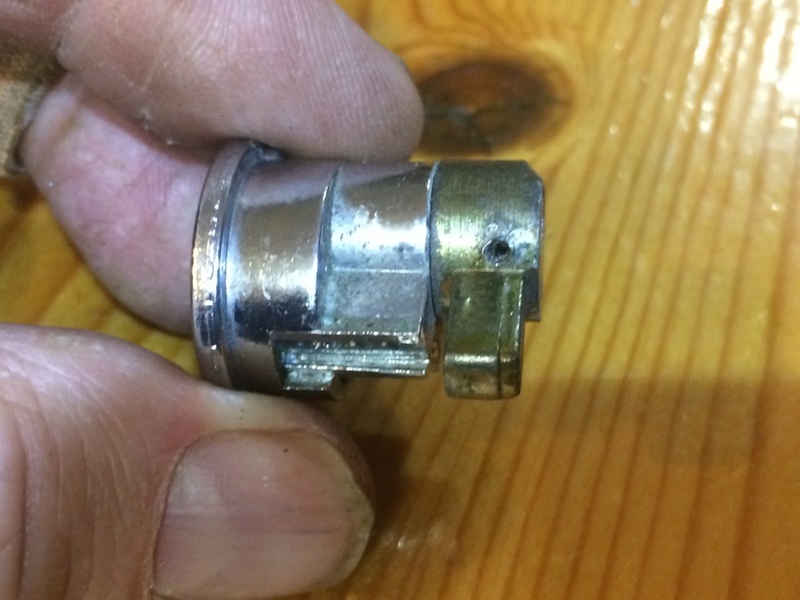 Once the meeting faces of the two sets of pins is aligned with the meeting faces of the housing and barrel the barrel can rotate with the key. A second set of columns in the housing provides the "open" position and allows the key to be withdrawn at this position. Note, in case they fall out, the pins in the barrel are pointed on the key side and flat on the side photographed. The flat face mates to the short pins pictured above. The next step is to simply cut and/or file the pins (they are brass so soft enough) flush with the barrel. 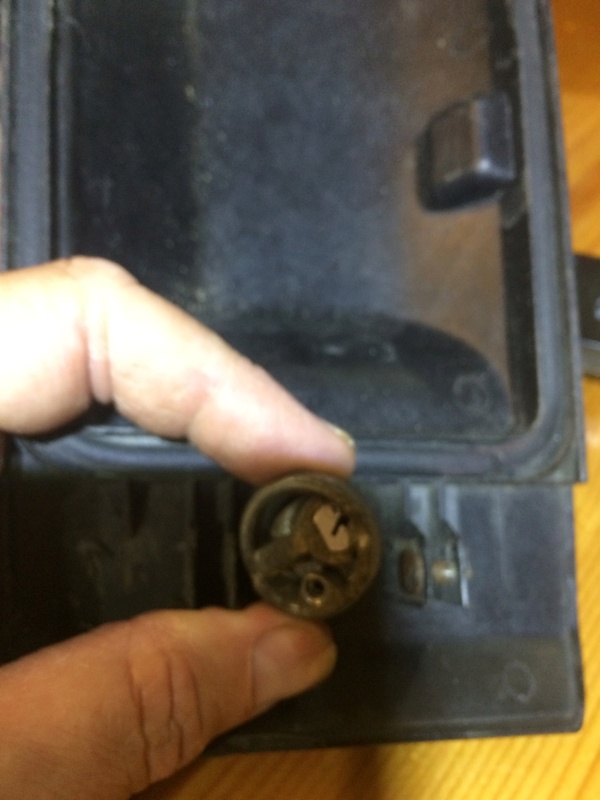 Any protrusion will stop the barrel from rotating in the housing. 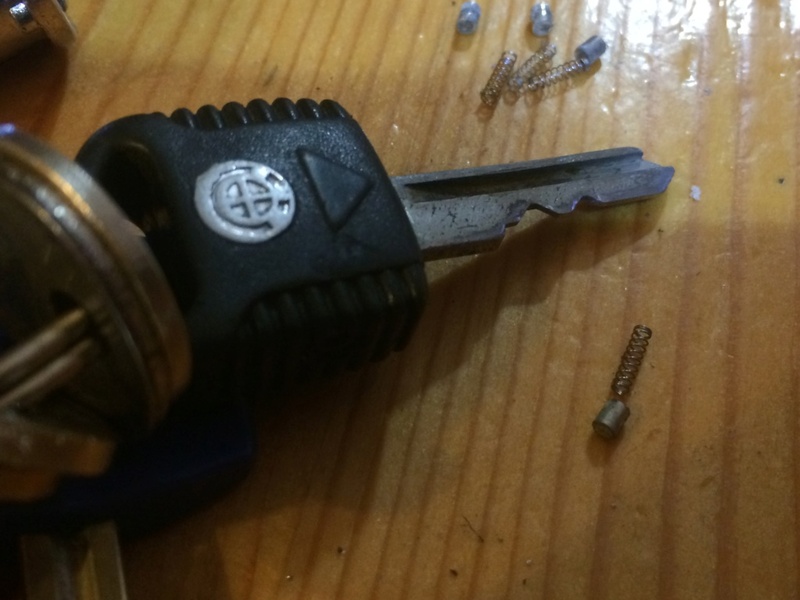 Once you are satisfied the pins match the key, reassembly can begin. 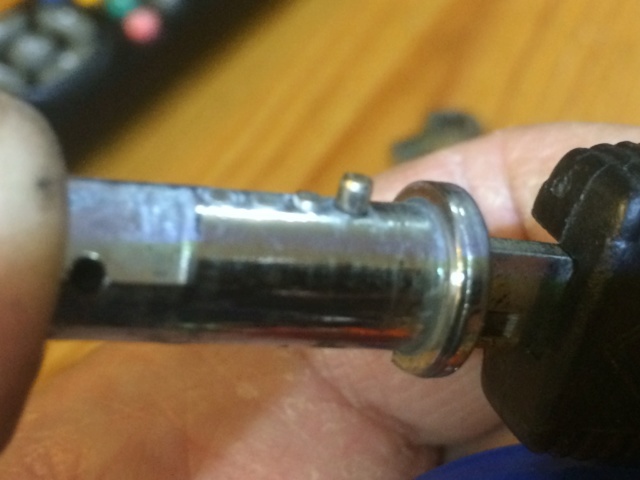 ( I find the best way to handle the springs is with a small jeweller's screwdriver inserted between coils. Reassembly of the rest is a straightforward matter. 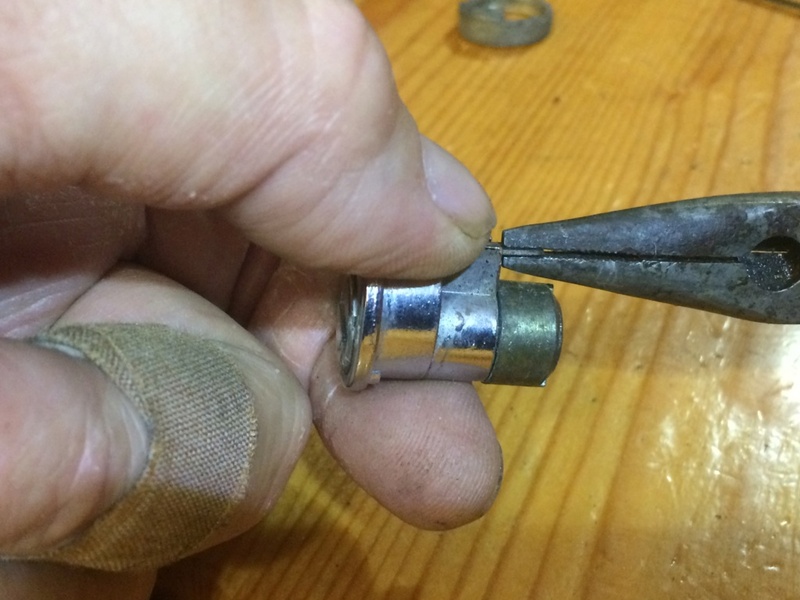 The roll pin may be reused if you were lucky with the drill otherwise a suitable small screw will replace it. Test it vigorously at this stage and you my have to have a second go at filing the pins. Thanks for this Will - the inability to lock the covers has always bugged me but the keys that operate them are either long gone...or the covers in place are not the originals - or both. I'll give it a go this weekend and mark you out of 10 on your instructions. I must admit, I was amused by the narrative saying "use a sharp punch" and the associated pic of a plaster on one of your fingers! coincidence I assure you ! @88 wrote: coincidence I assure you ! A couple of years ago I tried something similar, however the small springs made a bid for freedom and disappeared completely. 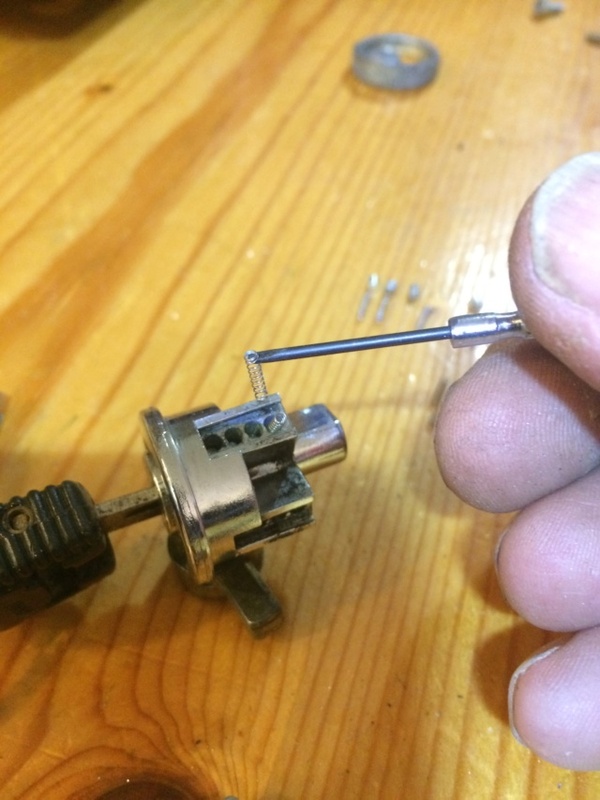 I now have a lock that any flat object can turn. 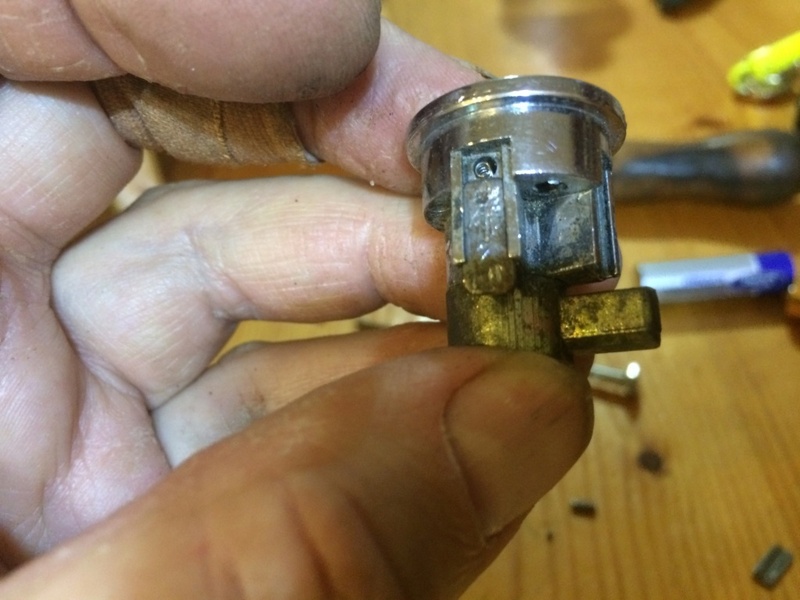 Paul: when you do your lock, can you measure the size of the springs and note them here because (Stan) you will be able to get new ones on the modelling sections of ebay. Been there, but not with the pocket lock. Ah! I remember - I lost a GPI switch spring and ebay provided five for about AU$1. 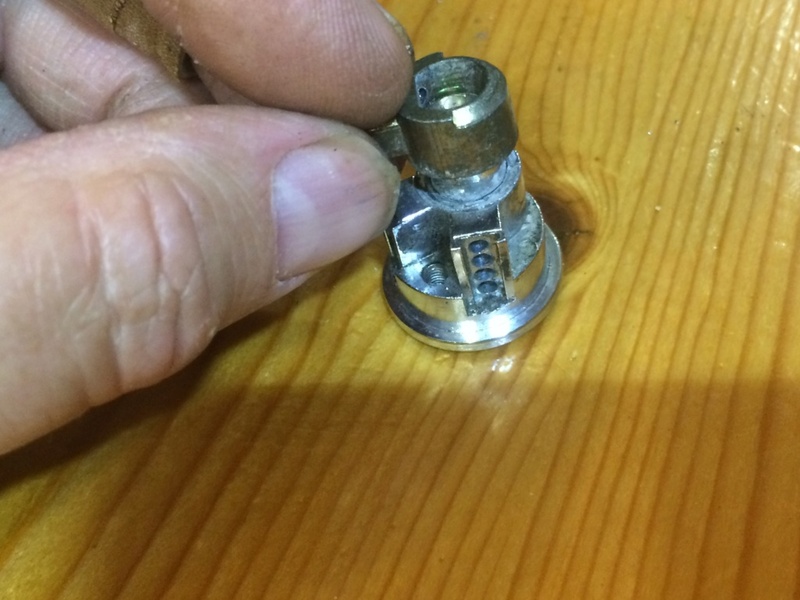 @Dai wrote: Paul: when you do your lock, can you measure the size of the springs and note them here because (Stan) you will be able to get new ones on the modelling sections of ebay. Been there, but not with the pocket lock. ...and the answer is the springs are 6mm long, in the uncompressed state. There's 8 of the pesky little things - I found that they behaved quite well when dismantling the lock, but made a concerted bid for freedom when gently trying to compress them in order to slide the retain covers back into place over each group of 4. Not a job to be done in a messy workshop with no end of spidery corners for them to hide. Anyway, the good news is that Will gets a 10 out of 10 for his "How to". 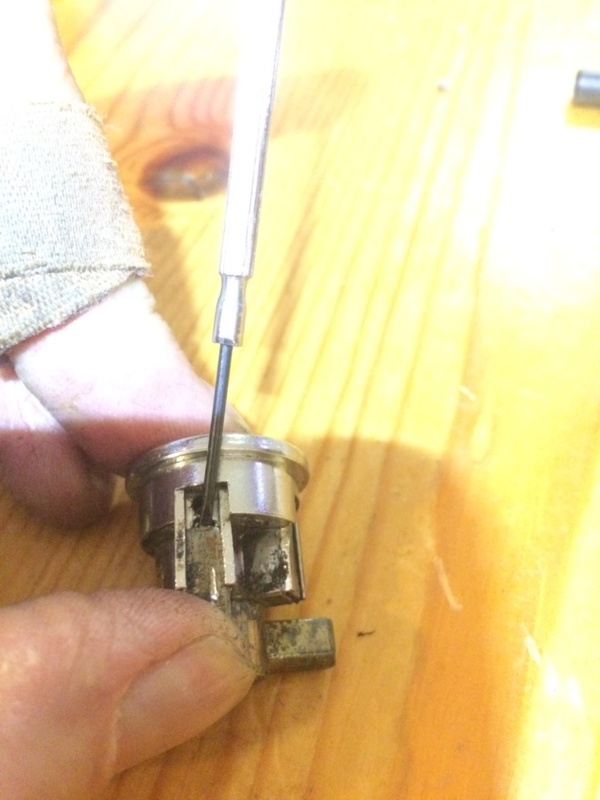 It's a fiddly little job and getting that roll pin out takes a little patience. In the end, I found that only 1 of the 4 on my two LTs needed re-keying and I was able to do this successfully. 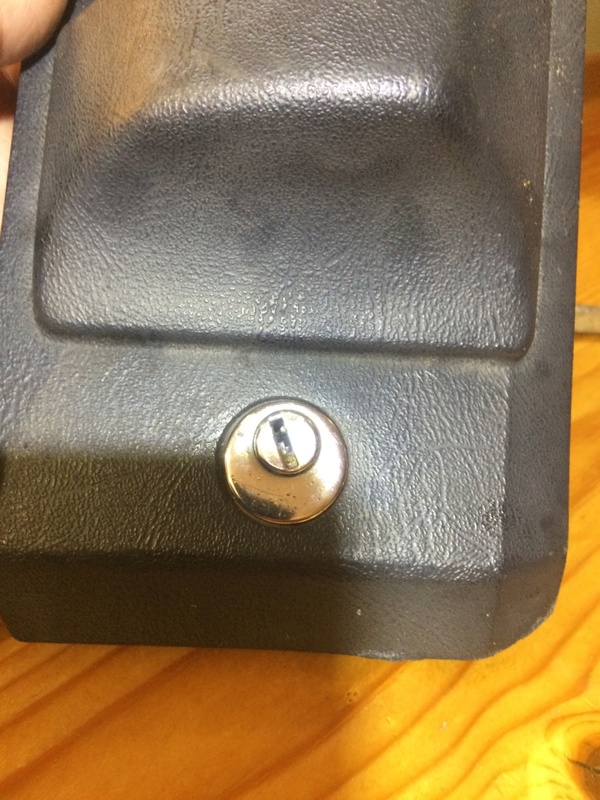 However, both my left side covers (the bulbous radio style cover) can still be opened easily, even when locked, without needing anything inserted in the lock at all...so those locks are pretty pointless. The right hand side (flat covers) both seem to lock reasonably securely - well, securely enough to stop casual thieving little fingers chancing it, but I wouldn't leave anything of any value in the pockets as I don't think it would take more than a split second with a screwdriver or similar the lever to pop them open. I have 2 spare covers from my donor bike - both are in the locked position, which prevents access to the securing ring screw to allow removal of the lock mechanism from the cover. They probably could be re-keyed in situ, but I'll see if I can find the donor bike keys and see if they work first. you could try some other keys as well. Some years ago Blakey and I went around the assembled bikes at one of our gatherings and between our two keys we could open/start 80% of the bikes. Keys and locks wear and you never know, you can get lucky. The only lock on my 83 basic that is precious is the steering lock which will not accept the fold down key, but will take the long solid key. 88 post has been converted to a PDF and stored on the kforum-tech server. Download it from this site.